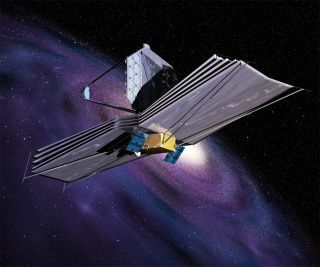 Artist's depiction of NASA's $8.8 billion James Webb Space Telescope, which is scheduled to launch in 2018. John Mather is the James Webb Space Telescope's biggest fan. The Nobel laureate, an astrophysicist at NASA's Goddard Space Flight Center in Greenbelt, Md., is the senior project scientist for the new observatory. Slated to launch in 2018, JWST has been called the successor to the Hubble Space Telescope. Yet the $8.7 billion project has frequently been delayed and over budget. To make it to launch day, the controversial James Webb Space Telescope must win support from Congress during tough fiscal times. SPACE.com: How far along are you in the process of building James Webb? Mather: We're roughly halfway through the budget to get to launch. We still have a lot of work left to do to put the parts together. We have finished the designs for hardware and a fair fraction is actually built. When we get the parts in, the next big job is to put them all together and test them. SPACE.com: How many of the technologies for the telescope are brand new? These are all huge projects. In rough order of magnitude the Hubble and the JWST are not that far apart in terms of total human effort that it takes. The Chandra is also in the same ballpark. They all require new inventions, new technology and great effort. It'll take a few more years before all the stuff arrives here at Goddard and we can put it all together. SPACE.com: Will JWST really be ready to launch in 2018? Mather: I think it's pretty firm. We have included in our budget and plans some reserve for the possibility that something that's not in the plan might happen. We always do that. We think we've allowed enough for that to be the launch date. Some people think we've allowed too much. SPACE.com: How do you feel about the delays and cost overruns of the project? Mather: It's always unfortunate. What we've learned mostly is that we didn't allow enough money in the first place. It's not that we had unexpected technical problems, but they did cost more to solve than we were anticipating. We've had some interesting challenges. The main conclusion that was reached by the external review board is that you should have had more money to start with. Then the total cost would have been lower. SPACE.com: How confident are you that you'll get the funding you need to build and launch James Webb? Mather: To tell you the truth I have no basis for confidence or not confidence. I am not part of the political process. There's been this tremendous outpouring of public support. I'm hopeful that Congress appreciates the importance of it. I know there are people in the Congress and Senate who love science and love this particular project. People worry a lot. Especially when the economy has its troubles. People do have their fears. I understand there is a plan which limits the potential changes to relatively small amounts. Our project is currently running 2.5 percent of the NASA budget. That’s not actually so much for something that's so tremendously important. There might be across the board cuts to a lot of things in this work. We just do the best that we can here and try to make the technical plan that matches the world we live in. SPACE.com: Why is JWST so important? Mather: It represents the hopes and ambitions of the 10,000 astronomers who have already used the Hubble. It is tremendously more powerful than the Hubble, in a new wavelength range. I'm pretty confident there will be surprises out there, things that will be worth all this work. SPACE.com: What are the most important scientific questions the telescope will address? Mather: Questions from what were the first stars like, how were stars like the sun formed, to even what are the planets like that are around other stars? We're looking for those rare things that are at the earliest times in the universe — that's something that I'm really excited about. It's quite unlike some telescopes that were intended for a single topic. This will serve basically anything that's out there that we can see. The telescope is so sensitive we can pick up the radiation from a bumblebee from the distance of the moon. SPACE.com: How important is the telescope to the U.S. astronomy community? Mather: I think people are counting on it. People are going to graduate school and making their plans to observe with it. Right now we have wonderful observatories, the Hubble, the Spitzer and the Chandra that are American, and the European Herschel. In a few years it could be they're all gone. It could be this is the only one. Ten thousand people have used the Hubble Space Telescope and its archives. We are anticipating similar numbers will come to this new one.